Björn is our host for MTB this Thursday and he wants us to focus on onomatopoeia, which he rightly says is a great word and an important part of language. He has shared a dictionary definition and suggests we look for lists of onomatopoeia on the Internet so that we can follow his instructions in order to concentrate on the sound of our poems. Posted in Poems. Tagged dverse Poets Pub, Meeting the Bar, Onomatopoeia, Sounds of water. 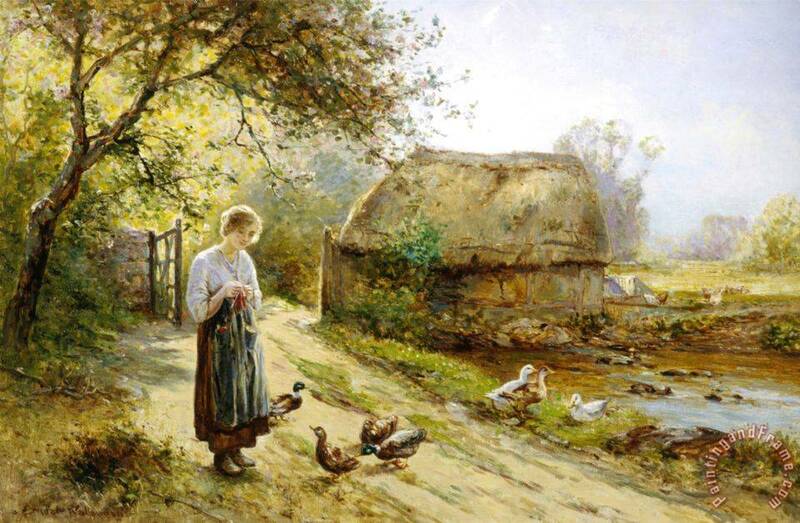 This is wonderful… I love how you started with the ducks and then the waters… to me this was a wonderful pastoral sense that made me see the painting before I scrolled down to see it… may your day be as good as this. The quacking and chuckling of ducks made me smile and really drew me in to experience the sounds. I love the convulsive weir pool so much. Especially as a place to dream, with all that water gushing. I love the pastoral feel of your poem! A bygone era, a pastoral whiff, a halcyon vision. Water, like the wind, makes lovely white noise to augment sleeping. I like the idea of breathing sounds. Thanks Gillena and much love to you! This is very idyllic and calming. The sounds of water run deep and I love the quacking and chuckling that accompany it. in its sinuous windings.’ You captured the moment so well! Sigh. (I wonder if the word ‘sigh’ counts as onomatopoeia?) Well, this piece (peace) makes me sigh, with a sibilant shhhhhh. Yes, sigh! Truly onomatopoeic and a satisfying sound. A bit like purring. The imagery of your poem truly brought the painting to life, thank you. We get so many different types of waterfowl along the coast here, especially in the marshes. I love the sound, swim and flight of ducks, which are quite comical. A beautiful pastoral scene you paint with all the sounds complete! just where the gurgling river passes – that is wondrous sound for sure. All the different sounds of water – beautifully done. I particularly love the last two lines. You’re back! Did you have a good break? And did you get to listen to water? Love the ducklings, sounds of water, and how you painted the art you used in words. “and breathe the sounds of water.” I never thought of it that way, but it’s true, much of the lure of water is in the sounds it creates. I love living close to water, it is so calming. Beautiful imagery, Kim! So peaceful: it’s a lovely scene you describe! Ah…. to breathe the sounds of water…. We shall do that soon. Leaving Sept 8 for two blissful weeks in our beloved Provincetown – at the very tip of Cape Cod. Our deck there is right on the ocean … and we shall breathe the sounds of water. I shall remember this line! Provincetown sounds wonderful Lill! I have always been attracted to Cape Cod and I think it would be a perfect place to write. Have a great time there. Enchanting. I could hear everything! Nice Poem.Beautiful imaginary. Thanks for your sharing.